Those clouds! Totally clear skies where I was but tall, billowing storm clouds about 20 miles away, right where the moon was coming up. 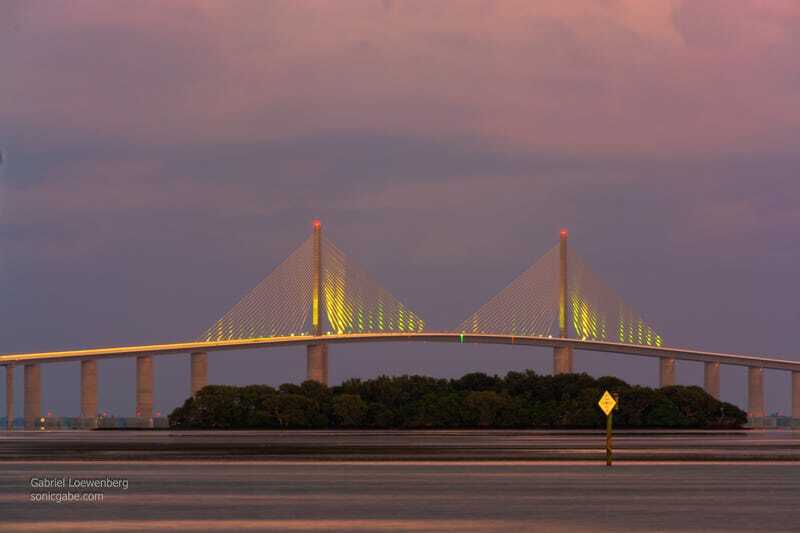 In the header, the moon should be somewhere between the two towers of the bridge, almost like a gemstone set in a ring. Oh well. Today is going to be clouded over, so no second chance with a mostly full moon. Sunday, too. Because moon rise and sunset were virtually at the same time, there were really great orange and purple hues happening while I was out there. While I got no moon pics, I did spy this little wading bird looking for dinner. I believe it is a Little Blue Heron. It caught several shrimps while in my sight line. Still waiting on some baby sea turtles to hatch. I will probably be spending a night or two on the beach in the next week or so, which frankly ain’t too bad of a thing to do. Though if I happen to not be there and someone sees that it’s happening, I live close enough to get there for most of it. I’ll be going to sleep each night with my camera bag packed and ready to go in case I get the call at three in the morning.